Search and rescue crews Friday morning were out in force looking for two Vail-area climbers missing after reaching the summit of one of the Maroon Bells near Aspen on Wednesday. On Wednesday, October 8th, 2014, around 10:00pm, the Pitkin County Sheriff’s Office received a report of two overdue hikers from the area of the Maroon Bells. 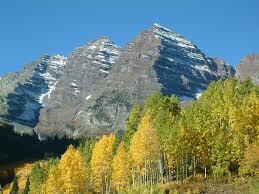 The Maroon Bells are two peaks above 14,000 feet located about 12 miles southwest of Aspen. The caller, who identified herself as a friend of one the climbers, was calling from the Vail area and reported that the two climbers had sent her a picture from the summit of one of the peaks around noon on Wednesday. The climbers did not contact her later that evening, and around 8:00pm, she grew concerned. A vehicle belonging to one of the climbers was located at the trailhead around 10:30pm on Wednesday night. Members from Mountain Rescue Aspen (MRA) began to mobilize and on Thursday, three teams of MRA rescuers entered the field on foot in search of the climbers. Inclement weather made a search from the air impossible. As of 9:15pm on Thursday, all MRA members were out of the field with the search expected to resume on Friday morning.